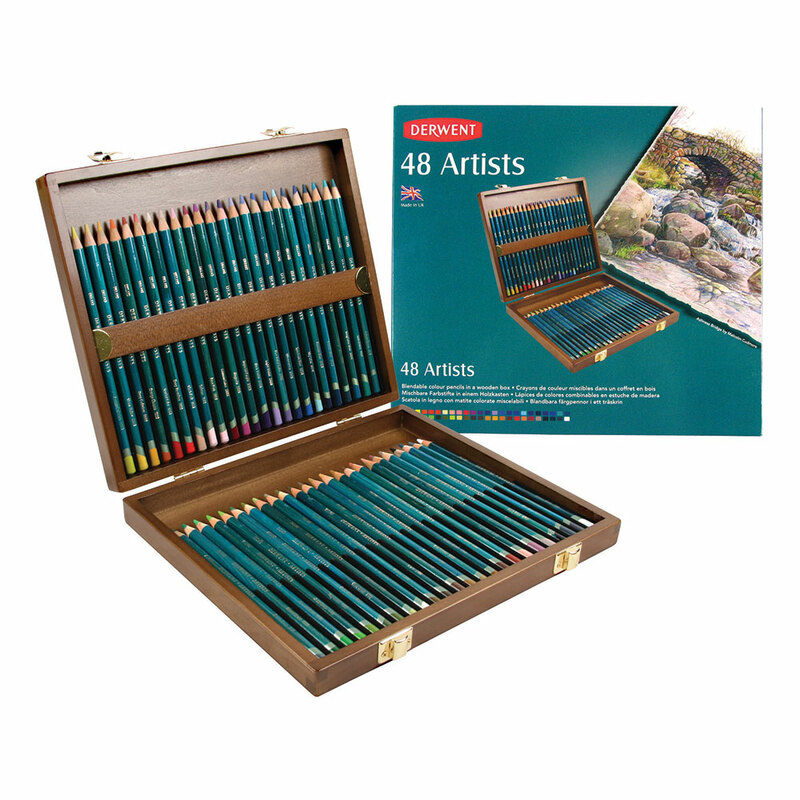 With Derwent Artists Pencils you will be spoilt for choice! There are 120 colours in the range and their waxy texture makes them ideal for layering and blending so you can create as many of your own colours as you wish! They have a nice fat colour strip which is ideal if you want to create really expressive drawings. 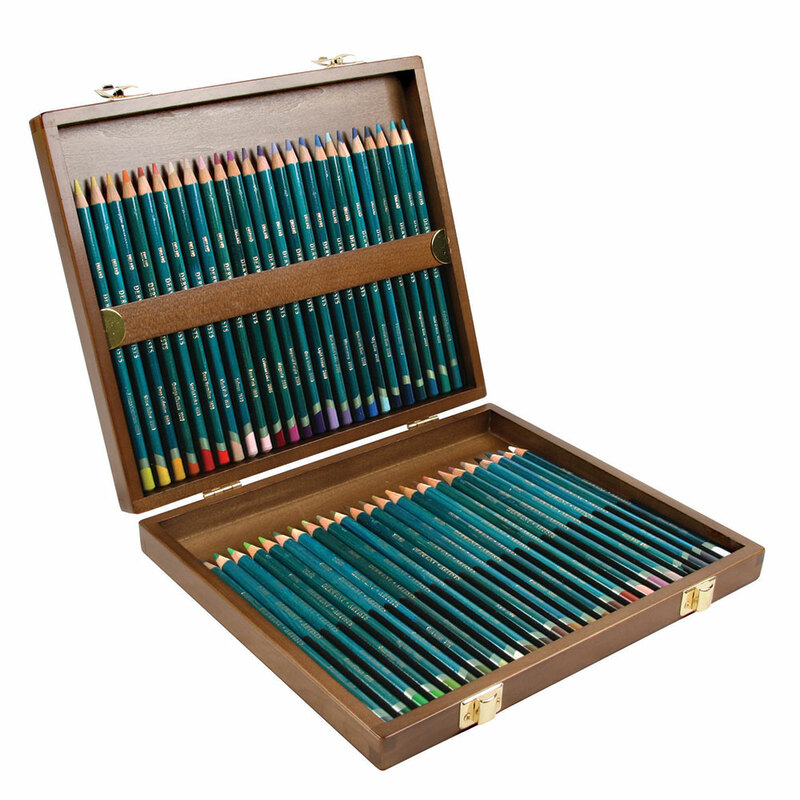 Presented in a beautiful walnut wooden box containing 48 pencils. Lemon Cadmium, Straw Yellow, Deep Cadmium, Orange Chrome, Scarlet Lake, Deep Vermilion, Flesh Pink, Salmon, Rose Pink, Crimson Lake, Magenta, Imperial Purple, Dark Violet, Light Violet, Blue Violet, Ultramarine, Spectrum Blue, Sky Blue, Prussian Blue, Indigo, Phthalo Blue, Kingfisher Blue, Jade Green, Cobalt Green, Spruce Green, Mineral Green, Emerald Green, Grass Green, May Green, Cedar Green, Olive Green, Chartreuse, Parchment, Bronze, Burnt Umber, Vandyke Brown, Brown Ochre, Raw Sienna, Golden Brown, Copper Beech, Terracotta, Light Rust, Burnt Rose, Taupe, Ivory Black, Blue Grey, Gunmetal and Chinese White.